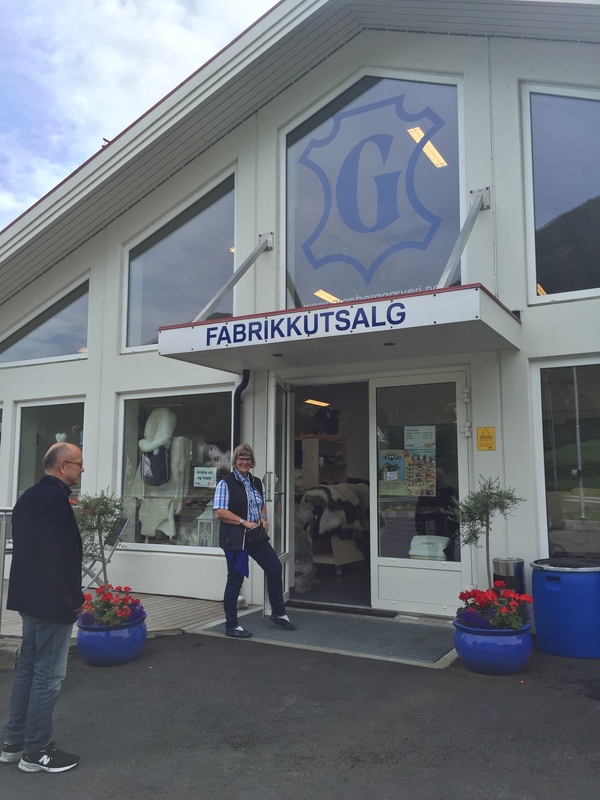 As opposed to my last two visits to Norway on Vesterheim Textile Tours, this was a trip to introduce my husband to Norway – mission accomplished! 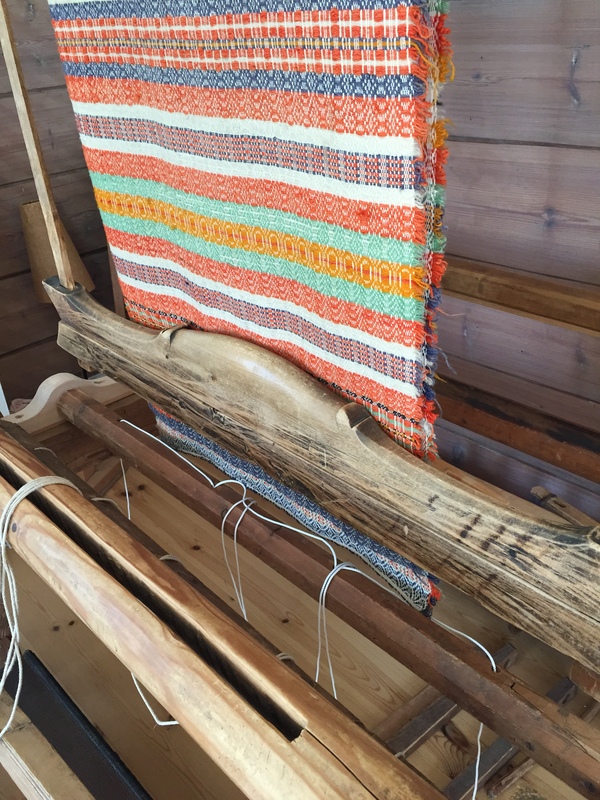 Even though I minimized my textile seeking to the blockbuster exhibits of Hannah Ryggen in Oslo and Frida Hansen in Stavanger, you can’t help but find more weaving as you travel in Norway. When we first arrived, we stayed with my friend Inger Berit Myhre, with whom I attended weaving school at Valdres Husflidsskole in Fagernes, Norway. On Inger’s couch lay a pledd, a fulled wool blanket, almost the same as one I have. 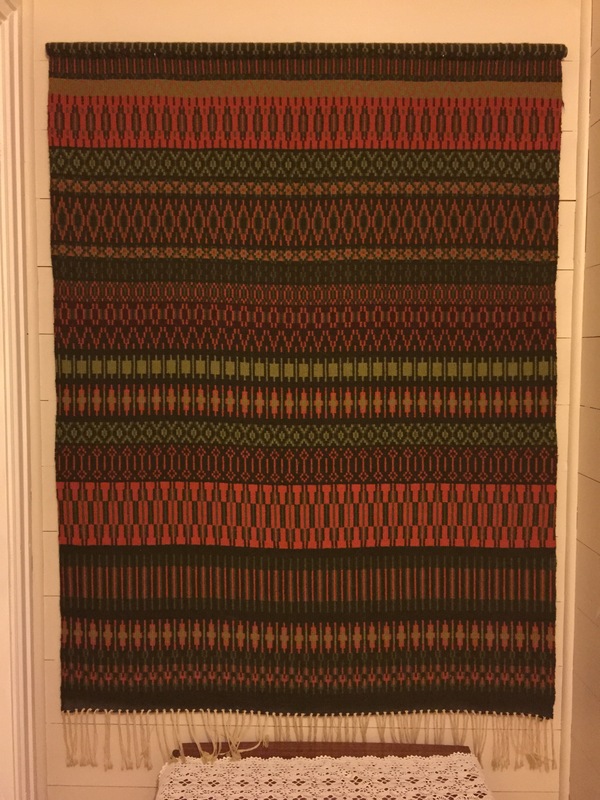 It should be – it was woven from the same warp in 1977. 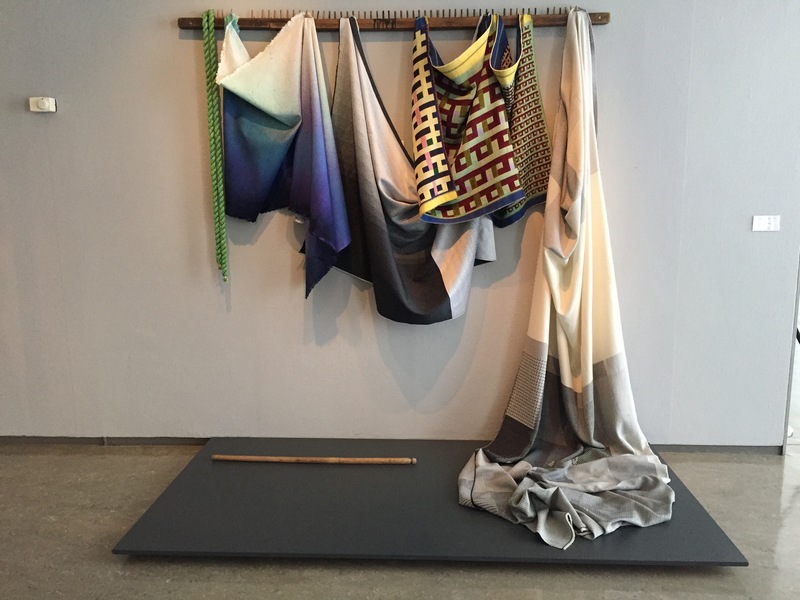 We visited the tapestries of Hannah Ryggen at the Nasjonalgalleriet in Oslo, and they were fully as wonderful as I had anticipated. Moving to the southern coast, we stayed with Annemor Sundbø in her apartment in Kristiansand and above her store in Ose up in the Setesdal valley. We stopped at her newest home outside of Kristiansand, a house that had been dismantled from a runway path site and rebuilt in its current beautiful spot. The white wooden exterior contains within it an an old timber cottage which forms a number of interior walls. It is a perfect combination of modern functionality and charm of the old. One of her looms embodies that, too. 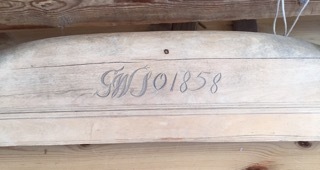 She has a very old counterbalance loom with a beater bar that became fragile with centuries of use, so Annemor found a “newer” one, from 1858. 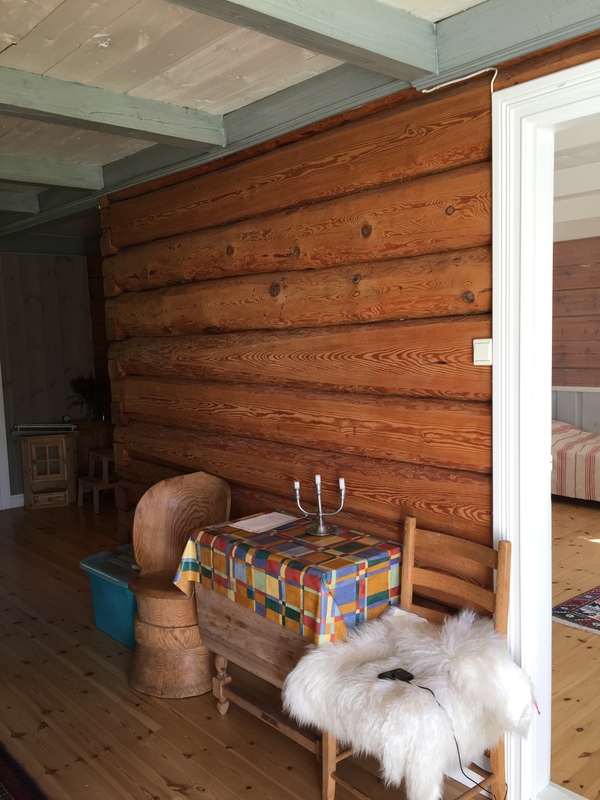 Annemor owns many vilsau, the ancient indigenous Norwegian wild sheep breed, in a cooperative. The sheep are kept on Bragdøya, an island outside of Kristiansand. I did not buy any yarn from those sheep, but we did eat a very delicious leg of villsau lamb. I had a self-imposed ban against purchasing yarn on this trip, since I am still weaving with the weft I purchased in Iceland two years ago. Instead, I went for sheer weight in books, and hoped that the partially-detached strap of my backpack would hold. 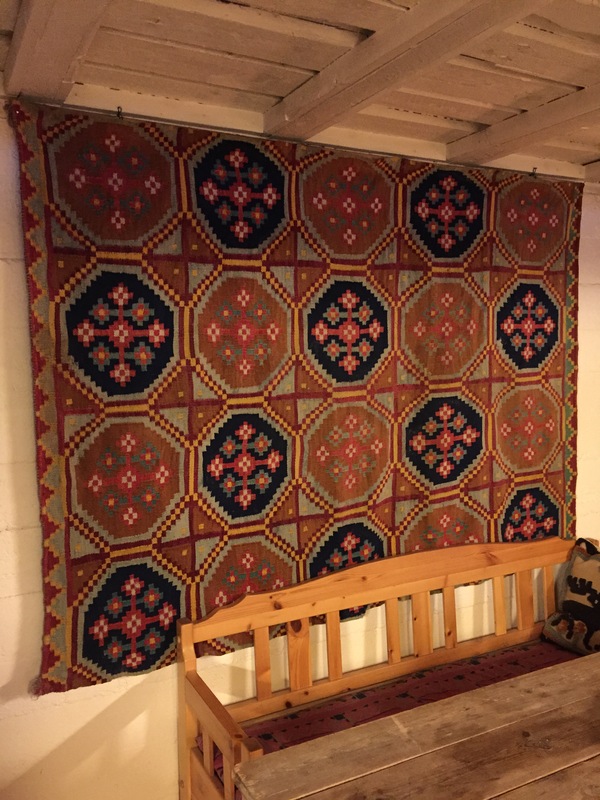 Here is a beautiful rutevev (square weave) coverlet on the wall in the cellar of Annemor’s shop, right next to the wood-fired oven where she often makes 40 loaves of stone-baked bread at one time. These elg (moose) in half-flossa have a lot of personality. 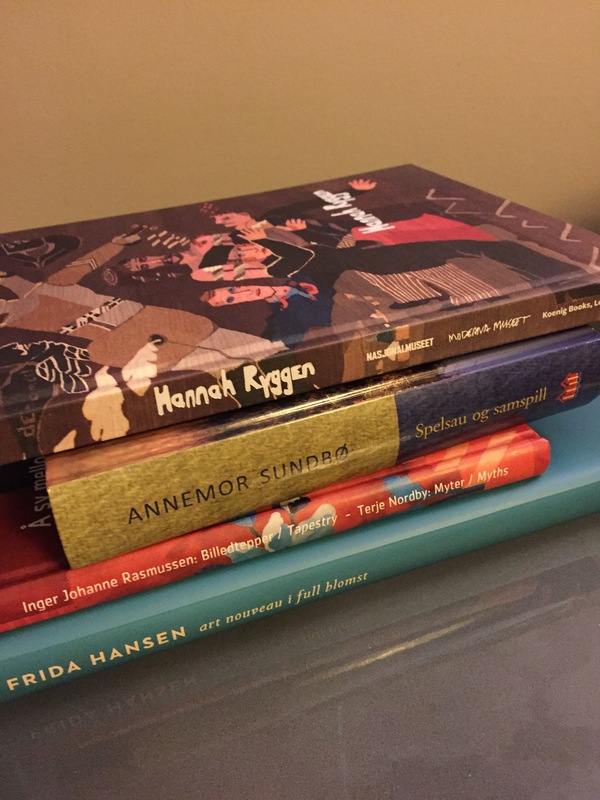 Our friend Ingebjørg Monsen met us in Stavanger to see the Frida Hansen exhibit. It was enormously fun to examine the tapestries with a fellow weaver. 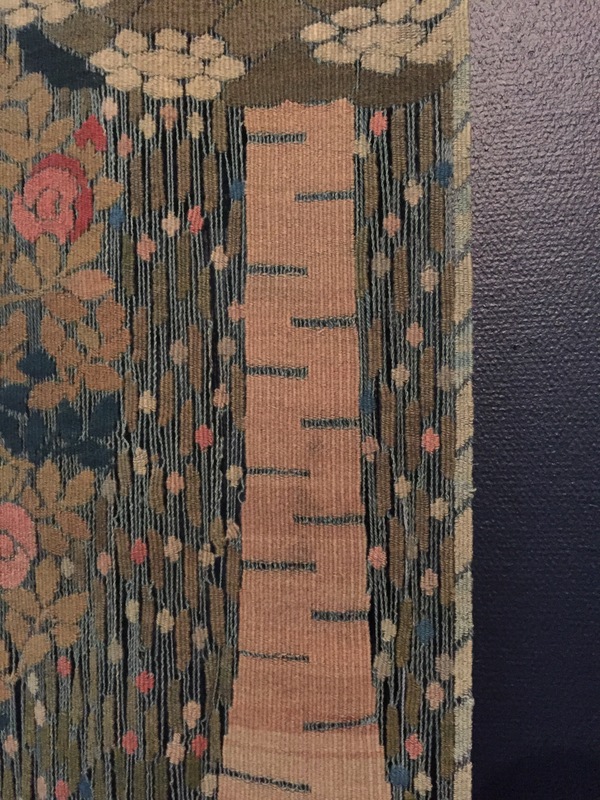 Who else would be excited to look at the thickness and the extreme twist of the warp threads of Hansen’s tapestries in transparency technique? After the Stavanger stay, we traveled up through Hardanger and stayed with Ingebjørg’s friend Kjersti Bondhus. 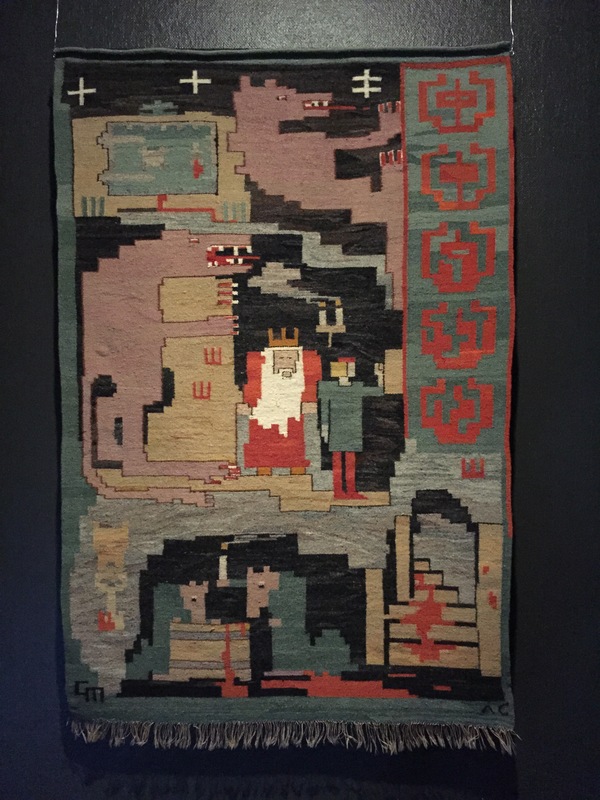 Kjersti went to Husfidsskole in Bergen, in the same era I was in Valdres, and the weavings in her home indicated she had a similar curriculum! 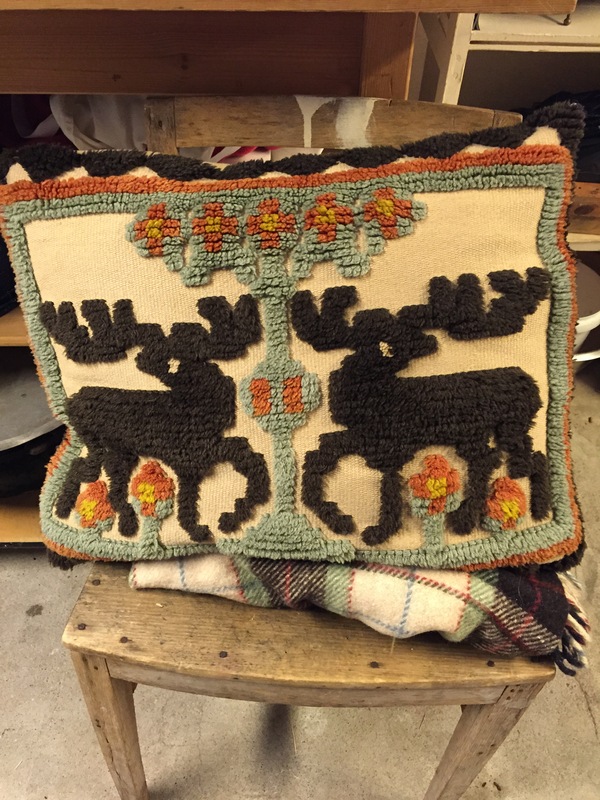 Kjersti had several krokbragd coverlets in a refurbished barn that is now used to serve tourists. 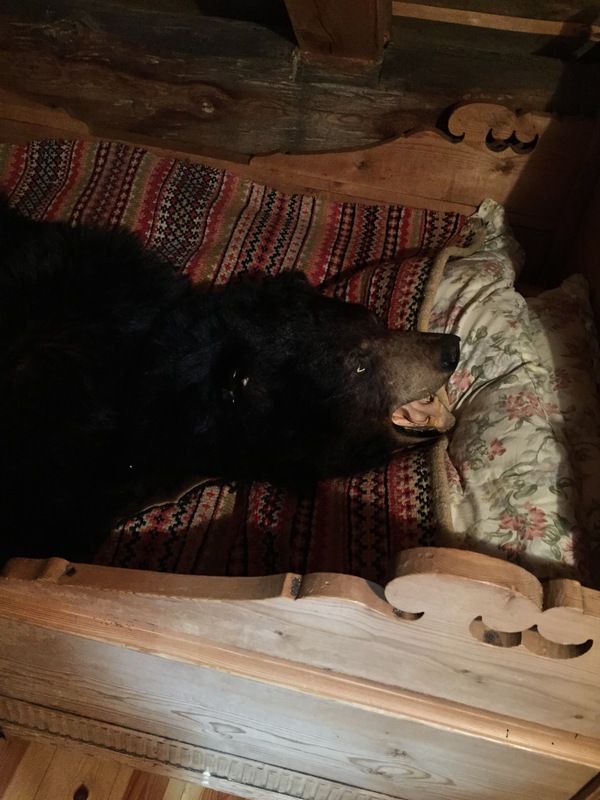 One was in a beautifully carved bed, along with a bear! 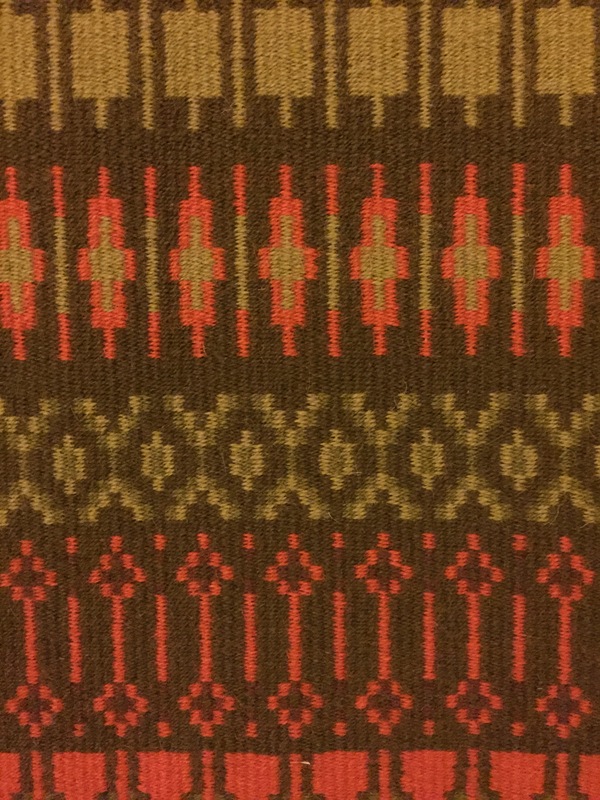 This piece that Kjersti wove was termed by Ingebjørg as a krokbragd on rosepath tie-up (krokbragd på rosenbragd renning). Ingebjørg still called it a krokbragd because of the long floats on the back. She said that Norwegians don’t have the same bunden rosengang tradition, as in Sweden. Ingebjørg will begin to teach her new class of weaving students in a week or so, near the center of Bergen. She teaches one weaving class, which will have 6-8 students, and two sections of bunad (national costume) sewing. In the twelve-week, 48 hour course the students are mixed, with rank beginners as well as those who may have been in classes for years. The season costs around $85.00. The long-term students have varied reasons for continuing. Some try increasingly difficult projects, some are there for the social aspects, and some find crucial support for their weaving at home. When the students have been in class a while, Ingegjørg warns them, “Pay attention; you may have to help the newer students.” On occasion Ingebjørg will make a house call, sometimes with some or all of the other students in class. After the loom gets warped, lunch is served. We saw many sheep on our trip, especially driving north of Stavanger to the Hardanger region and Bergen. Injebjørg said that you need about 400 sheep to make enough money for one family. These were mostly sheep for meat. 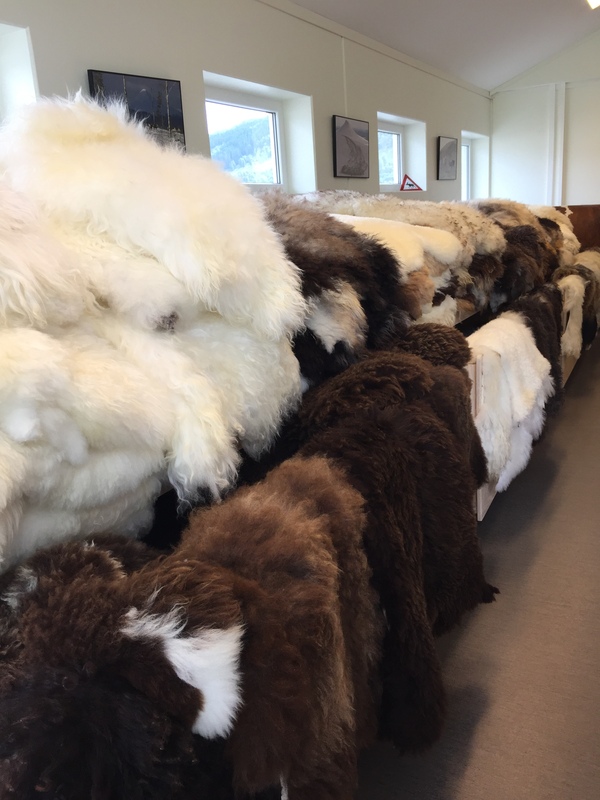 Some fleeces are tanned, however, and we made a stop at the Granberg Garveri, A SHEEPSKIN OUTLET STORE. Unfortunately my heavy load of books and limited suitcase space meant I could only buy a small square from the leftover bin. Our last two days were in Trondheim, where I spent a wonderful morning at the Nordenfjeldske Kunstindustrimuseum, which has a strong textile collection. 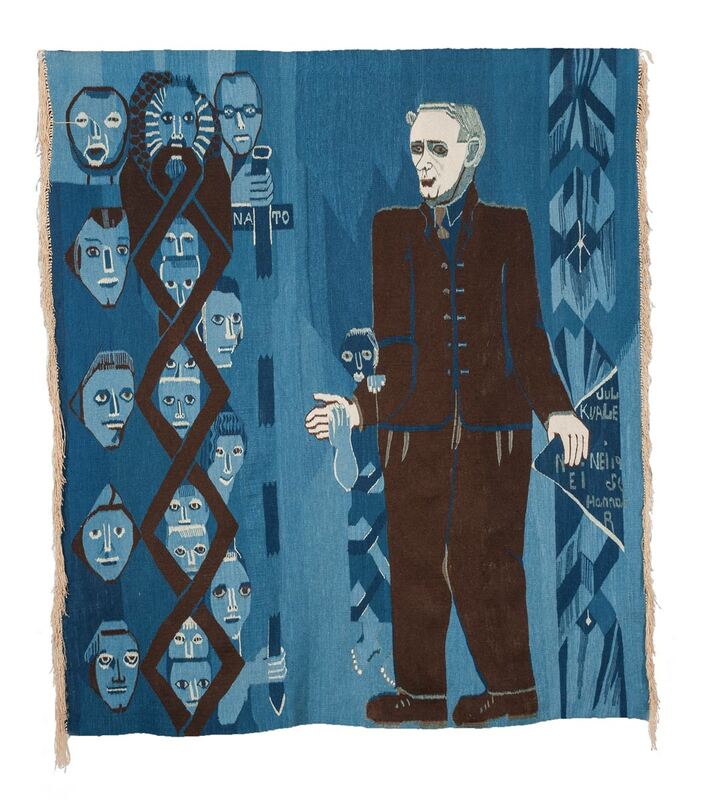 Normally the museum has a large display of Hannah Ryggen’s tapestries, because she was from that area. However, they were on loan to the exhibit at the Nasjonalgalleriet. 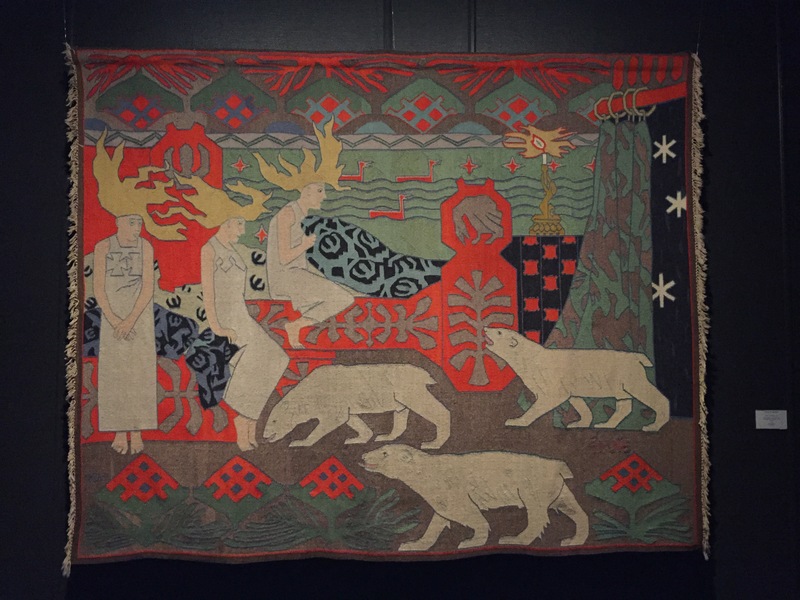 I was pleased to find a large room filled with tapestries designed by Gerhard Munthe. The colors in Munthe’s familiar “Nordlysdøtrene,” (Daughters of the Northern Lights, 1908) are bright and appealing. “Blodtarn” (Bloody Tower, 1902) was an interesting image with a gruesome bloody staircase and a toothy monster. The squared-edges of most forms bring the technique close to traditional rutevev, or square weave. I felt guilty when I left the collection because I hadn’t followed the advice of the enthusiastic young woman at the front desk. She had advised me not to miss the exhibit on paper cuts. I’m sure it was wonderful, but the collection of traditional and contemporary weaving stole every minute I had. For example, here is an interesting and cryptically-titled work, “Material as Metaphor,” by Bergen-based artist Kiyoshi Yamamoto. 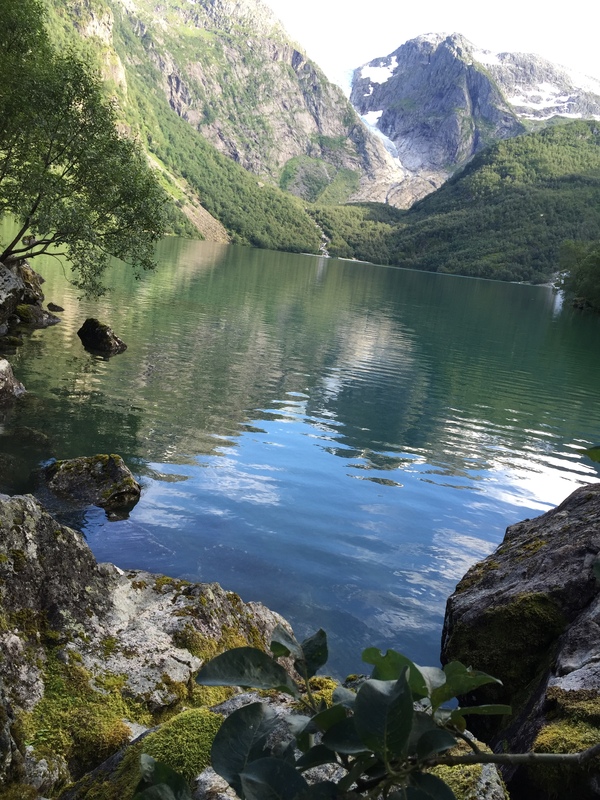 This museum visit capped two weeks of Norwegian mountains, fjords, cities, and seashore. The weather was perfect, and we were reminded by every person we encountered that the summer, thus far, had been rainy and cold. Tusen takk, Norway!